What does the future hold for librarians’ participation in teaching and learning in colleges and universities? Many are already taking advantage of the opportunities pro­vided by the emergence of new technologies and faculty interest in giving students assignments that will engage them in their learning. I believe that the greatest oppor­tunities for librarians lie in deeper connections to the curriculum, adapting to new modes of pedagogy, linking technology-rich and collaborative spaces in libraries to learning, and ensuring that individuals who enrich the library’s role in teaching and learning are on staff. Over­all, the trajectory is for the increasing integration of librarians and libraries into the teaching and learning program of the college or university. The trends in higher education reform that emphasize active learning and learning as a social process converge well with an increasing emphasis on the need for students to develop collaborative skills and the ability to commu­nicate effectively and professionally in various media. Collaboration has received considerable attention in higher education instruction, and many libraries now offer learning spaces to support group work. Developing skills for sharing information in various media beyond the traditional written text is also growing in importance. The Degree Qualifications Profile (DQP), issued by the National Institute for Learning Outcomes Assessment (NILOA) and the Lumina Foundation in 2014, illustrates the kinds of proficiencies that students need to develop as they complete their academic work. For example, one of the proficiencies is: “Constructs sustained, coherent arguments, narratives or explications of issues, problems or technical issues and processes, in writing and at least one other medium, to general and specific audiences.” This inclusion of “at least one other medium” demonstrates the recognition that students will be called upon to com­municate in a variety of ways, whether they pursue gradu­ate academic work or enter a profession. However, many faculty members are not well prepared to construct as­signments that ask students to develop media projects or to work with students on those projects. Librarians can work with faculty on assignments that encourage students to experiment with new media. Students at the University of Pennsylvania’s Weigle Information Commons collaborate and share information on France. When faculty members assign students team-based, multimedia projects, they often incorporate changes in their own pedagogy, particularly active learning activities. This can create opportunities for partnerships between teaching faculty and librarians or other information professionals. Librarians can work with faculty to develop new assignments that both connect to the disciplinary content and encourage students to experiment with new media. In many cases, faculty are open to thinking about such assignments if they are not solely responsible for the technical aspects of its implementation. Librarians have the opportunity to work as partners with faculty, become resources for innovative teaching and learning activities, and guide students as they create new types of content for their course assignments. The staff at the University of Pennsylvania’s Weigle Information Commons media center have been successful in partnering with faculty from a number of departments to create and implement new types of student assignments. They include a French class assignment where students create a video of themselves acting a role of a self-created fictional character living in World War II Paris. An assignment in a South Asian Studies class has students create a video, working individually or in small groups, to trace a change in the meaning of a particular commodity either over time or as the commodity moved from one cultural context to another. In each of those cases, the assignment involves students’ finding relevant information of various types, integrating it into an innovative presentation, and producing a video that incorporates academic content. In the University of Pennsylvania’s Weigle Information Commons lab, students work on an assignment. Working with a wide variety of assignments, and not just the typical freshman composition assignment to search databases to locate and read a certain number of journal articles, leads librarians into deeper engagement with the curriculum. Introducing freshmen to basic library concepts is important, but librarians may have greater impact if they focus more resources on working with students in upper level courses in their majors and on capstone projects. Integrating a wide variety of information concepts into a student’s academic career, focusing on such issues as the mechanisms of scholarly communication in disciplines and the economic and privacy aspects of information in society, is a much richer set of topics than an emphasis on the mechanics of searching for information. A document under development by the Association of College & Research Libraries, the Framework for Information Literacy for Higher Education, addresses the need for a more sophisticated and integrated approach for librarians’ interaction with learning. This table illustrates the direction in which I hope that library involvement in teaching and learning will move in the future. Types of student projects Term paper All types – papers, videos, websites, data visualizations, 3-D printed objects, etc. For libraries to become more deeply involved with learning, they need people who are willing to be involved in innovative instructional development and who have the requisite skills. Faculty in higher education institutions are often criticized for their inattention to pedagogy, but it is also often noted that few faculty have had any formal preparation for teaching. Similarly, there are many academic librarians who have had no formal preparation to take on teaching roles. Librarians with limited teacher training can work with other librarians or library specialists to team teach or develop learning activities collaboratively. They can also work with individuals in a campus teaching and learning center or an undergraduate education office, which can provide additional benefits of connecting with individuals who understand teaching and learning trends in the institution. “Learning” in library spaces can mean many things. In traditional, quiet library spaces, students may read or think through complex problems or write, generally carrying out the tasks as solo activities. These experiences continue to have great importance, but they are not the only modes of learning. In new types of library spaces, students may be creating a website or a video, working with other students on a group project, collecting, analyzing, and presenting data, solving problems, incorporating special collections materials into a media product, conducting an interview with someone in a remote location, or making a physical object. Many academic libraries have made significant investments in technologies available to students and they also offer appropriate workspaces for student collaborative projects. One of the rationales for locating technologies and associated services in the library is that the library as a unit serves all of the institution’s disciplines. Although some campus departments might have expensive equipment in place, it is often available only to faculty, graduate students, and department majors. Even if others can use the equipment, supporting services are rarely available for the broad community. In addition to offering equipment, libraries design service programs to support a broad user community, facilitating innovation among individuals and departments that lack funds for high-end equipment. Examples of these provisions include data visualization technologies, geographical information systems (GIS), and high-end media production. One growing area for academic libraries is the development of makerspaces. The updating of library spaces to include many areas for collaborative student work, the availability of a variety of technologies for multimedia production, and library staff expertise in such areas as instructional design and multimedia creation can add real value to a college’s curriculum. However, when describing newly remodeled library spaces, advocates seldom cite particular ways in which the new library space supports key teaching objectives or how it helps faculty offer innovative assignments. Librarians need to explicitly map out a service program linked to learning when they plan new or renovated facilities, just as they pay attention to placing equipment and furniture in the facility. There may be new program emphases in departments that could take advantage of partnering with the library. For example, the libraries of North Carolina State University and University of Nevada, Reno, work with courses to incorporate the use of 3D printing technologies into assignments. Often faculty and students don’t realize what specialized technologies and expertise is available in the library. One way to highlight what students can accomplish in media assignments for their coursework is to feature large screen digital exhibits of student work with explanations of the kinds of content they used and the ways in which they incorporated technologies available in the library. 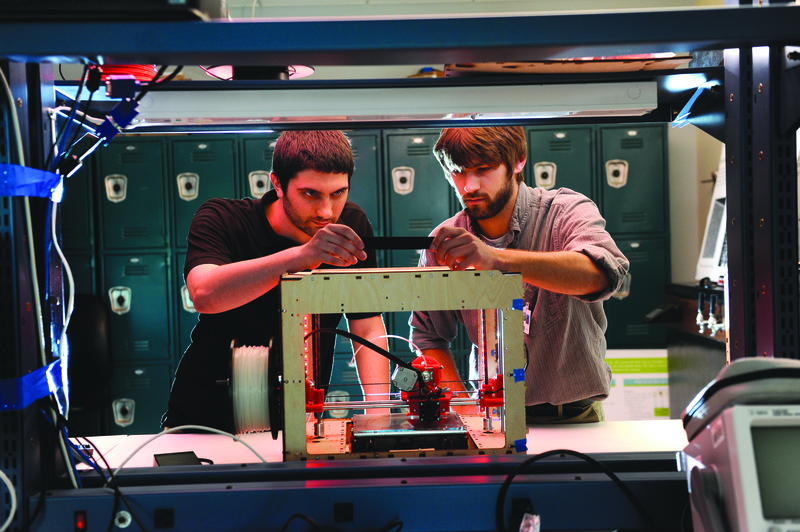 Kyle McKenzie and Corey Meade print an ” audio bracelet” with a 3D printer at North Carolina State University’s Hunt Library. In the future, successful involvement by librarians in teaching and learning will increasingly focus on gaining a deeper understanding of the academic programs they serve; this is part of the growing emphasis on developing a robust liaison role for academic librarians. Librarians will develop a sense for what types of courses include assignments where critical aspects of information literacy are relevant. They will help students become sophisticated content creators in a variety of media, and they will increase students’ understanding of important issues related to information. 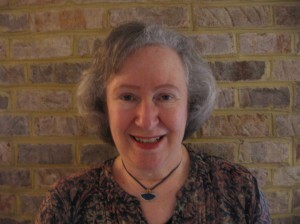 JOAN K. LIPPINCOTT is associate executive director of the Coalition for Networked Information (CNI), a joint program of the Association of Research Libraries (ARL) and Educause.